This is one of 3 in the beginning of a new series of split 10” records with really cool fold out Malleus artwork. Ironboss start things off with 4 fast paced tracks. The band hail from Maryland and are helped out by Wino on the last track, Walk like a Man. These guys remind me a bit of Drive by Shooting from Berlin. Walk like a Man is a nice old school hard rock track. 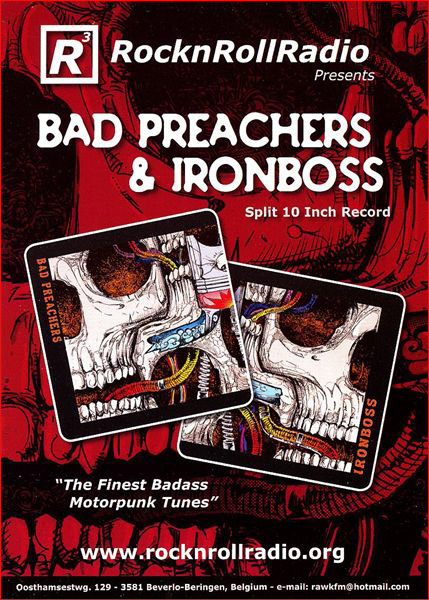 Bad Preachers from Belgium also kick out the jams with 5 short tracks. These guys are a bit like a more heavy metal version of Charged GBH (not quite as fast) at times. Travelin’ Man even features some harmonica over its hard driving rhythm. Born in Flames is the best track on the side but all are strong tracks. These guys are a cool new band, for me..